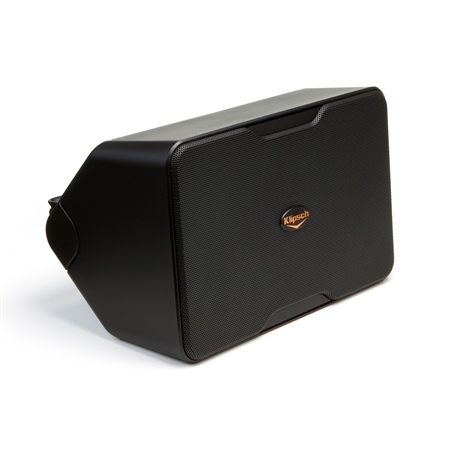 INDIANAPOLIS (June 16, 2014) — Klipsch, a leading global speaker and headphone manufacturer, announces the debut of the Compact Performance Series 70 Volt speakers (CP-6T and CP-4T) at InfoComm 2014. Show attendees can experience active demos of the two new high-design speaker models as they meet with team Klipsch to learn more about the brand’s commercial sound solutions from June 17-20 at the Las Vegas Convention Center. Both speaker models are made specifically for the commercial audio market and boast clean lines and a smaller size to compliment any business décor, indoors or out. A unique integrated mounting bracket provides close-to-the-wall placement while a V-shaped cabinet rear profile allows the speakers to tuck tightly into a corner for a seamless look with maximum bass output. The Compact Performance Series 70 Volt speakers are also equipped with Klipsch’s proprietary Tractrix® Horn technology to provide unrivaled low-distortion clarity and detail. The CP-6T is the perfect choice for numerous commercial applications of varying sizes given its high sensitivity with four tap settings. Its 8 ohm bypass allows quick adaptability for venues that specify separate 70/100 Volt and low impedance zones in the same system. The CP-4T’s high efficiency provides sound reproduction at even foreground music levels with its single 5-watt tap setting. The CP-4T sells for $300 per pair and the CP-6T for $430 per pair (U.S. MSRP). The brand’s new KPH-525 Housing Pendant will also be on display at InfoComm 2014, and it is designed exclusively to fit either the Klipsch IC-400 or IC-525-T In-Ceiling 700/100 Volt Commercial speakers. The KPH-525 is ideal for high-ceiling structures or areas with no suspended ceiling for direct, overhead distributed sound. Klipsch will be exhibiting in the Central Hall at booth C11147 inside the Las Vegas Convention Center. The brand will also present audio demos of its latest Permanent Installation Series speakers in room N106 located north of the Central Hall. Special demonstration hours are Tuesday, June 17 from noon-1 p.m., 2-3 p.m., and 4-5 p.m., and every day June 18-20 from 10-11 a.m., noon-1 p.m., 2-3 p.m., and 4-5 p.m.